â€œI See,â€ Said the Blind Man as He Picked Up His Controllerâ€¦. Comments Off on â€œI See,â€ Said the Blind Man as He Picked Up His Controllerâ€¦. Think youâ€™re good at video games? Maybe itâ€™s time you went up against Brice Mellen of Lincoln, Nebraska. What makes Brice so special? Heâ€™s blind. 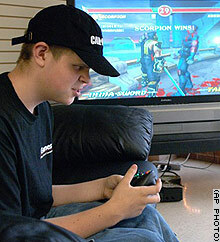 Brice spends his time hanging out at the Dog Tags Gaming Center in Lincoln. Apparently, people will come in and challenge him, expecting an easy win, just to get their heads handed to them in Soul Caliber 2. With only a year left of high school to go, Brice plans on attending college. What might he be studying? Video game design, of course! Next time youâ€™re stuck on a hard level of Halo 2, imagine doing it blind! You can read the full stories at CNN and TheOmahaChannel. Thanks to J-Love for sending me the original article. If anyone is interested in challenging Brice, itâ€™s pretty close to my place in Omaha. Road trip? Of Course I Can Walk on My Hind Legs….. I just choose not too. Continuing the ongoing saga of my page header, I have now added back paw prints to the puppy walking across the screen. Thanks for all the great comments and feedback. Let me know if you have any other ideas. Also, on an interesting note, the picture in the header is from my expeditions in El Salvador. I took it at the basin of a volcano where my Nica group spent the afternoon. During our meal, it began to get a tad rainy. When we were finished, however, rays of light began to break through the clouds and illuminate the lake. It was absolutely breathtaking. Finally, I put up a new cool somewhat daily video called Ddautta. If certain Japanese fluent friends could translate it for me, I would be very appreciative. Peace. Yesterday, Microsoft Corporation launched a new program designed to prevent people from updating pirated versions of software. According to InformationWeek, Microsoft estimates that about 12 million machines in the United States and 13 million in China run illegal copies of Windows XP. In order to crack down on this problem, they have created a program called Genuine Advantage that supposedly sniffs out pirated software on someoneâ€™s PC. They require that this program be run before installing any updates, including those to Windows Media Player, DirectX, and Internet Explorer. Microsoft has been working on this solution for 11 months. How long did it take to crack? Less than 24 hours. It should not come as a surprise that Microsoft is poor at security. It has been plaguing them for years and has been a major concern since 2003 when major bugs appeared in Windows XP. Even last summer, the US Department of Homeland Security came out with security concerns about Internet Explorer and recommended that users switch to alternative browsers. Note: As I write this blog, I am watching NASA TV and they are having issues getting Microsoft Outlook to work on ISS. What do they recommend doing? Reboot! Microsoft is at it again. Trying to keep up with Google, they just launched their own map website, Visual Earth, to compete with Google Maps. It is interesting to see how Google defines the direction the web will be going and it will be neat to see how the competition between the two creates new features. Upon inspection of the two websites, I find that Googleâ€™s is still easier and cleaner to use. On my computer, the maps are rendered more quickly and the click-and-drag scrolling is much smoother. Microsoftâ€™s maps do allow zooming using the scroll button which is cool but, while I would like to use this feature, it is too slow and choppy to be comfortable. The final reason I still like Googleâ€™s maps better are their up to date high-resolution satellite images. Microsoftâ€™s are still black and white and most are still from the early 1990â€™s. One rumor going around was that Microsoft had erased Appleâ€™s HQ off of their map. In reality, the pictures were so old, Appleâ€™s primary campus had not been built yet. Here are the maps to compare: Google, MSN. Iâ€™d be curious to know what other people think of the two. Comments Off on 3,2,1…. Again! Update (July 25th, 2005, 11:15am): Woohoo! Discovery has successfully launched and is currently on route to the International Space Station. Yay NASA! Currently, Cincinnati is sweltering at 95 degrees with a heat index of 107. Even my pup, Storm, doesnâ€™t like to go outside. Itâ€™s going to be about the same, tomorrow, for the astronauts blasting off in Discovery. After a faulty sensor in the fuel tank was examined, they have decided to launch regardless of fixing it. The launch time is set for tomorrow, July 26th, at 10:39am, Eastern Standard Time. All updates and the launch clock can be found at NASAâ€™s Return to Flight website. Originally, the major networks (including ABC, NBC, and CBS) were all going to break from their regular schedules to show the flight. Since the delay, I have not seen any articles stating they will do the same on Tuesday. If they donâ€™t show it, you can watch it on NASA TV, which airs both over the internet and through some cable companies. I spent some time cheezing out the site a little more. At Scot Buzza’s request, I re-did the header so now it had both people footprints and puppy pawprints. Also, I created an archive page for all the clips that I link to. If you have any recommendations, let me know. I would like to begin this post by sending out a warm congratulation to Lindsay and Marc Searcy. Our friends, recently married on July 16th, 2005, are now enjoying the fabulousness of Puerto Rico on their honeymoon. Congratulations, you two, and I pray you have a long and wonderful life together. The wedding took place in Owensboro, Kentucky. Owensboro is an awesome little town situated in northwestern Kentucky with great food and great cows. If you are curious about it, you can find out more at their website and then possibly buy something at their gift shop. Getting there is a piece of cake from Cincinnati. Or so Alex and I thought (and we were right). Instead of explaining to you why it took us more than a hundred extra miles and two hours late getting there, here is a map (courtesy of Google Maps). Instead of following the recommended blue line from the green mark to the red mark, we took the red route given to us by our significant others and their cohorts. Needless to say, it took us a little too far south and even a little too far west. Once we got there, however, the wedding was awesome. The best part (besides two people eternally bonding themselves together) was getting to see everyone from Xavier. Even Rachel Longest, just back from Micronesia, and Todd Guidry, in from New Orleans, whom I havenâ€™t seen for two years, both made it. And I now love Kentucky receptions. Everything was just simple and good. There was a nice hors d’oeuvres buffet with great little eatâ€™ns. The DJ wasnâ€™t fancy, but played really good music and kept everyone going the whole time. And instead of some fancy expensive bar, they had a handful of pump kegs and box wine in a side room. Plus, the families were great and needed nothing more than to know you were Lindsay or Marcâ€™s friend to strike up a conversation. As a guy who doesnâ€™t understand most weddings, I digged the whole affair. Good friends, good food, good weekend. Congratulations, again, Lindsay and Marc.